As recent protests in Brazil have highlighted, basic infrastructure in Latin America's wealthiest nation is, in many areas, horribly lacking -- a fact that the government has failed to address. Just how bad is it? Well, now disabled people apparently must build their own accommodations to enter public buildings. Samuel de Oliveira, a paraplegic from the town of Juína, had grown tired of waiting for the city to address a lack of wheelchair accessibility, so he decided to take matters into his own hands. Armed with a bucket of cement, wooden frame, and trowel, Samuel headed to the local health department -- a building frequented by people with disabilities -- and proceeded to construct a wheelchair ramp for himself and others to get inside. "I cannot stand anymore to pass through here, and I'm tired of waiting for the government," Samuel tells G1 Globo. "This is why I took the initiative to not wait any longer." Samuel, who lost movement in his legs from a gunshot to the spine in 2006, says that medical staff often attend to patients in wheelchairs on the street because they have a hard time getting inside, something he says feels humiliating. The local mayor, in response to the Samuel's action, has since apologized and promised that this issue of accessibility will be addressed better going forward. Failing infrastructure and unresponsive government leaders have been cited as a major issue contributing to the ongoing protests springing up in cities throughout Brazil. As the nation spends billions preparing stadiums for the World Cup, accommodations for the disabled in many places are virtually non-existent -- a fact that continues to go unresolved. 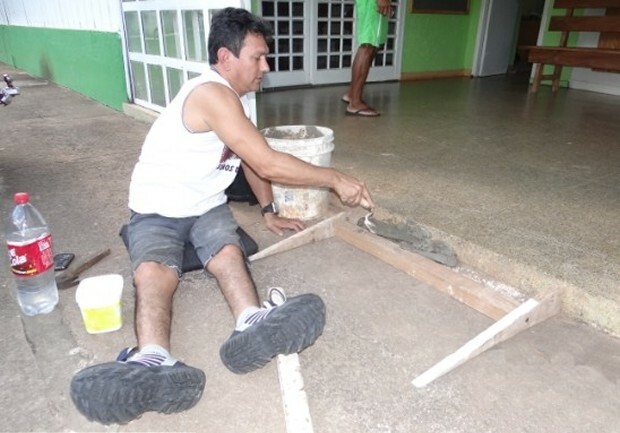 Though building a single wheelchair ramp may be a small action, it is perhaps indicative of a bigger realization among the Brazilian people -- that when things aren't working, it's up to them to fix it. Armed with a bucket of cement, wooden frame, and trowel, Samuel did what the local government had failed to do.